In my family, lasagna has become a perennial get-together food. It's not a legitimate holiday when there's no lasagna on the table. We do take our pasta dishes seriously on my mother's side of the family, and we only make them using the highest quality bakeware. No wonder my mother insisted on the best lasagna pan as one of the items on her Christmas wish list. Today, we'll show you what lasagna pans are made of, what to look for when shopping for one, and which among the five we reviewed trumps the rest. What is a lasagna pan? 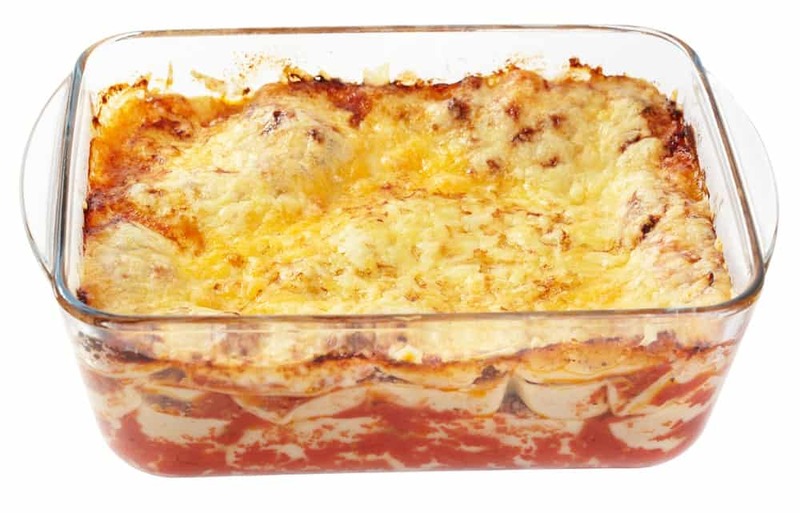 A lasagna pan is a bakeware often made of aluminum and ceramic. It is used to hold a lasagna, a favorite oven-baked pasta dish. These pans come in different types, sizes, materials, dimension, and shape. The best lasagna pan should feature useful additions like reasonably sized handles, a spatula, and a rack, to name a few. Any bakeware that's over 2" deep is considered a deep dish. 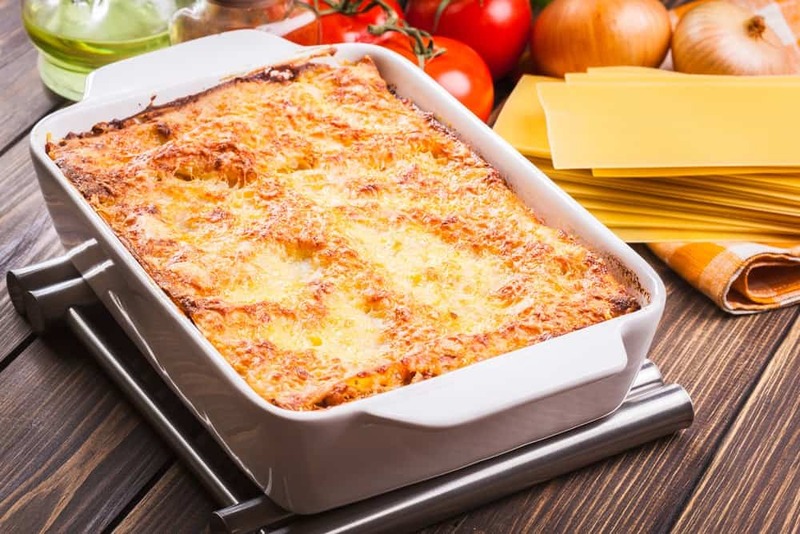 Deep lasagna pans allow for more layers and leave room for a rich thick cheese topping. You'll see that the most common deep dishes are 3" in depth. 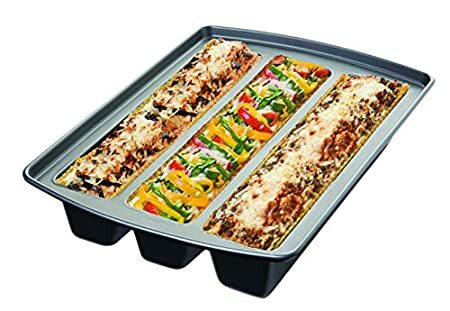 Triple-compartment lasagna pans are great if you wish to make three different flavors of lasagna in one baking time. Some triple-compartment pans come with convenient lift-up handles for easy serving. Aluminum is an excellent conductor of heat. It is the most lightweight material for a lasagna pan. It's fairly strong and scratch-resistant. The only drawbacks are that it doesn't distribute heat evenly and it tends to get pitted if you cook acidic foods in it. Is lasagna acidic? It's a tomato-based dish, so yes. Ceramic is perfect for making lasagna because it gradually heats up. It also doesn't react to the composition of the food, so acidic foods like lasagna won't have an effect on the bakeware, and vice versa. While ceramic pans are not non-stick, they have a smooth glaze that almost achieves the same goal. Also, you can serve the lasagna directly from the attractive ceramic pan. Like ceramic, glass lasagna pans are non-reactive. They're a good heat conductor and browns the dish pretty well. If you like slightly burnt cheese topping, you're going to want to get a glass lasagna pan. Cast iron pans are versatile. They can be used in the oven, on a grill, and on a stove without worrying about it cracking, chipping, pitting, or boring a hole. You can also use any utensil with a cast iron pan and not see any dent or scratches on the pan's surface. However, cast iron normally only heats evenly when you pre-heat it for 10 minutes. Another drawback is it's a bit heavy. Stainless steel is rust-resistant, scratch-proof, and even easy on the eyes. However, you should know that it has poor heat conductivity. The trick is to get a stainless steel lasagna pan with either copper or aluminum core. The reinforcement will significantly improve how the stainless steel pan conducts heat. Silicone lasagna pans have a non-stick finish that allows for easy release of baked goods. They are generally BPA-free, and are f﻿﻿o﻿﻿od grade silicone. Do you have limited storage in your home? Don't worry, silicone lasagna pans can be folded up. Copper is popular in the kitchen, albeit being expensive. Why? Because aside from its aesthetics, it's a great heat conductor. Copper adjusts to temperature and it distributes heat, allowing for a more even cook. Carbon steel is a cross between stainless steel and cast iron. It's cheaper than stainless steel and more expensive than cast iron. You know how some cast iron pans get smoother after you've used it several times? Carbon steel pans get better with age too. The pans are typically coated with a non-stick finish, allowing for easier maintenance. However, you should still be careful not to let a carbon steel pan sit in water for a long time. 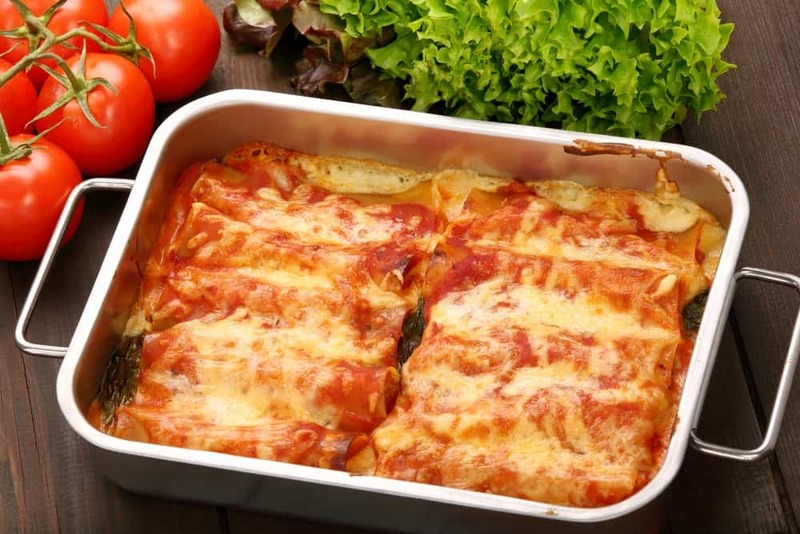 Lasagna sheets measure approximately 13 inches, so you want your lasagna pan to be at least 12" long. The extra two inches will allow for easy serving, especially if you're making the lasagna in a deep dish that has no lift-up handles. The standard glass and metal lasagna pans are 2.5" deep, but try to get pans that are 3" deep, 12" long, and 9" wide. Consider the features when shopping for a lasagna pan. What's the coating? Are there lift-up handles so you can easily lift the lasagna up without breaking its form? Does it come with a lid? Also, check if it comes with a roasting rack because lasagna pans are versatile. You can always use it for cooking something else! A nice lasagna pan will include a spatula that fits its grooves. That's not a deal-breaker, though. 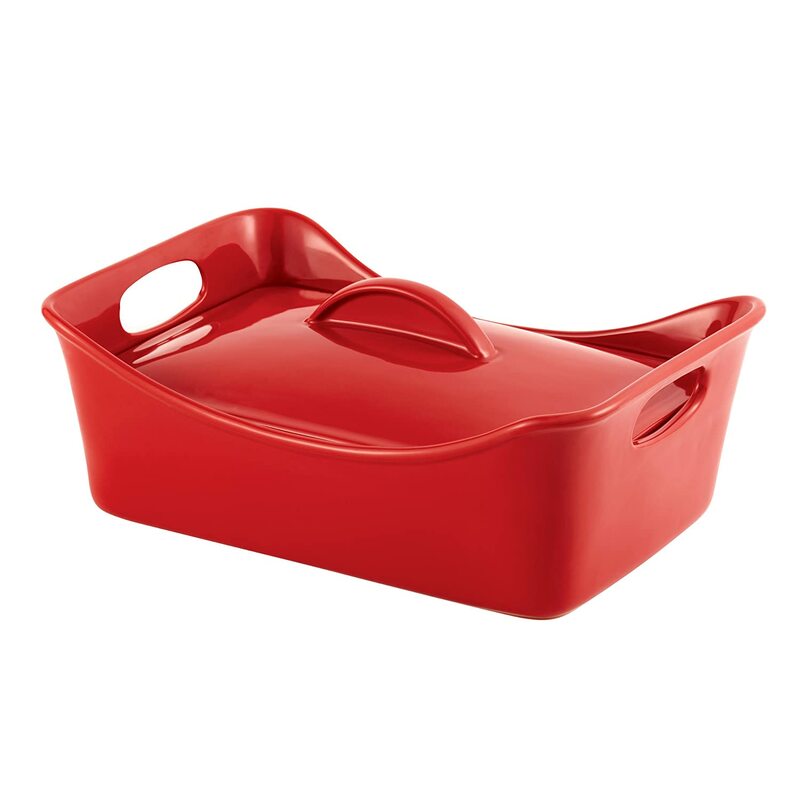 The Rachael Ray Stoneware lasagna casserole stands out for its color, convenient shape, and construction. Bakeware needs to be easy to pull out of the oven, and this lasagna pan achieved that goal with its wide handles and secure grip. While the pan's aesthetics can be deceiving, the pan is actually durable enough and can withstand 500 degrees Fahrenheit heat. This Rachael Ray pan comes with a lid and has a non-porous surface. Expect a stain-free stoneware from Rachael Ray. This covered pan is dishwasher-safe, microwave-safe, and freezer-safe. It measures 13.5 x 9 x 4.5 inches and weighs 8.9 pounds. The 7117-14RR is Cuisinart's newest addition to their Chef's Classic line. 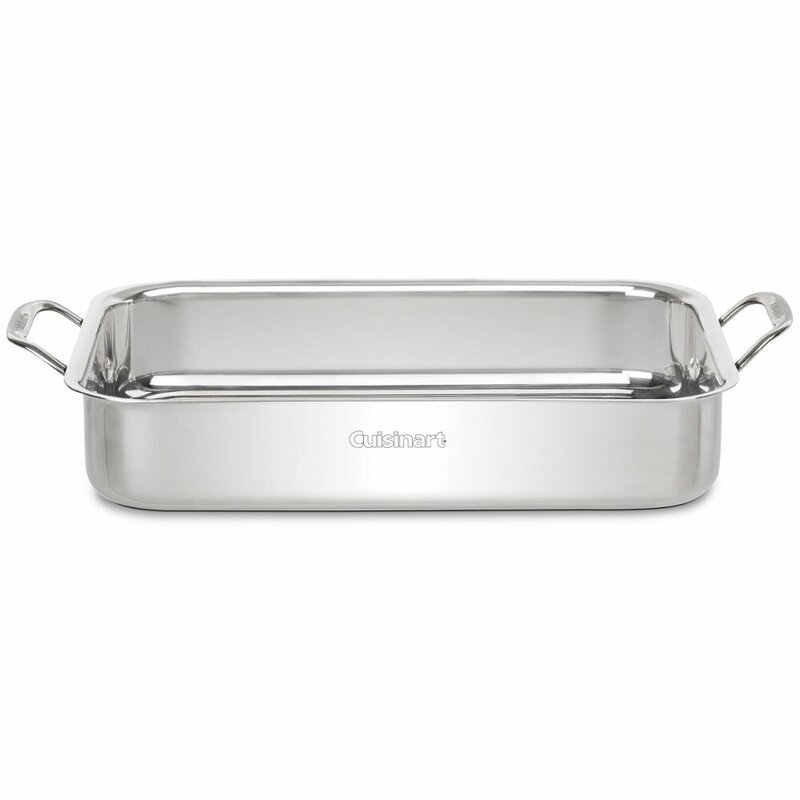 It comes with a roasting rack and is made of aluminum with a mirror finish. The Cuisinart 7117-14RR has side handles, making it easy for you to place the pan inside the oven, as well as taking it out. 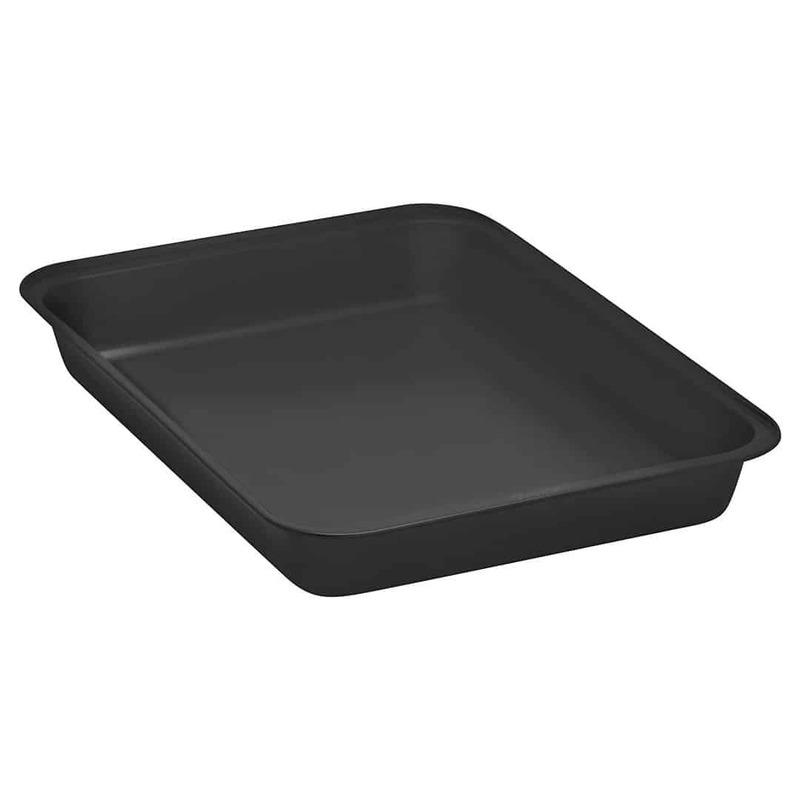 Since it's a roaster, you can use this lasagna pan for cooking other foods such as chicken, beef, pork, or small turkey. The pan measures approximately 3 x 10.5 x 13 inches. 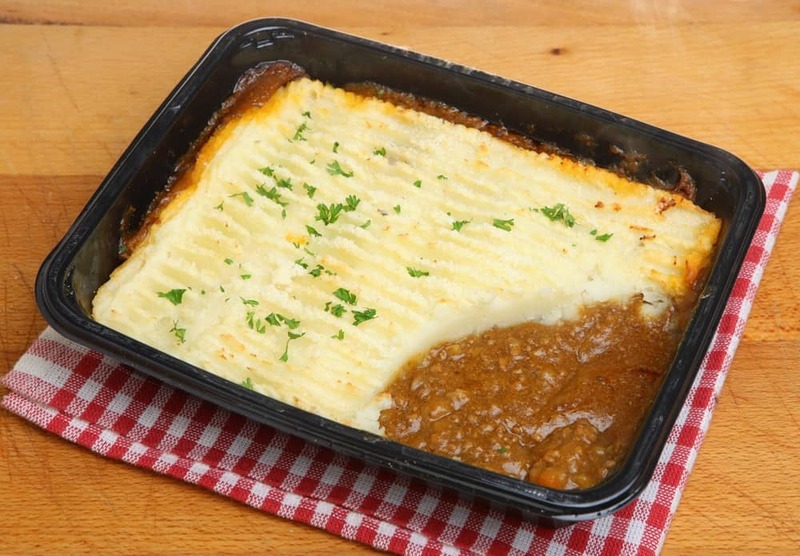 Dimension does not allow full accommodation of a standard lasagna sheet. This pan also blocks moisture absorption, thus preventing rippling and cracking. Take extra care, though, as you can't put this pan on a stovetop. Because it is stoneware, expect variations from every piece produced. The pan measures approximately 11.5 x 7.75 x 2.75 inches. The pan is made of non-stick coated steel and measures 15 x 12 x 3 inches. It's very light at 1.9 pounds. *If you need pointers on how to make a vegetarian lasagna, watch this video here. Standard lasagna sheets fit perfectly. The Baker's Secret lasagna roaster is made of 0.5 gauge steel. It's a large roasting pan that's perfect for an occasion with an expected big number of guests. 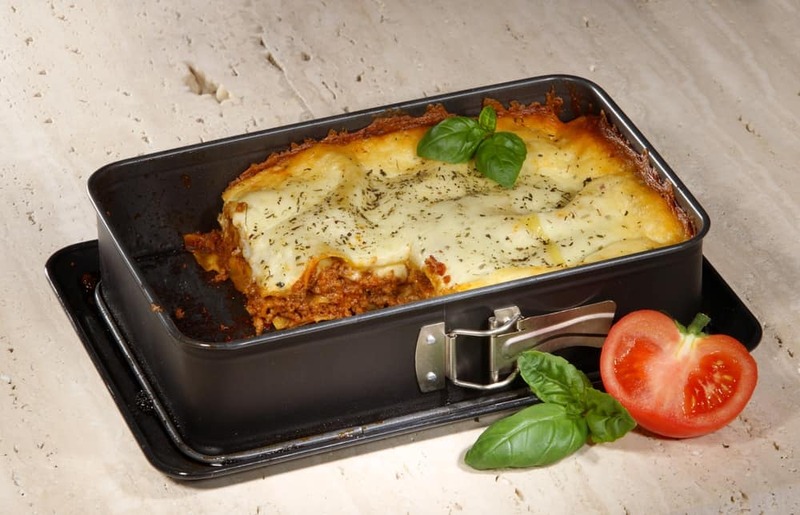 This lasagna pan features a non-stick finish and is dishwasher-safe. Unsure of its quality? Don't worry, the manufacturer is confident enough of its quality that it offers a lifetime warranty. If you want a heavy-duty roasting pan that's easy to maintain, try the Baker's Secret Essentials. This pan measures 14.5 x 10.5 x 1.8 inches and is very lightweight at 1.4 pounds. Coating chips off over time and after prolonged exposure to heat. The non-stick finish needs cooling time before washing. 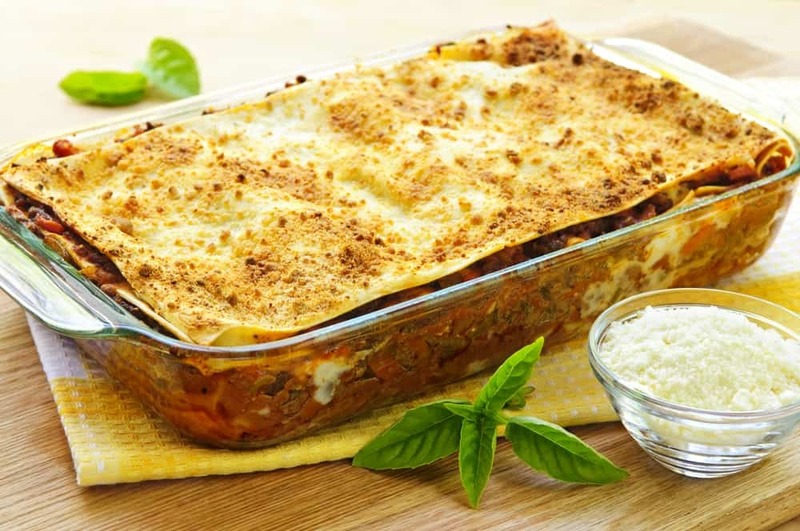 For a large family like ours who get together 2-3 times a year for catching up and enjoying our traditional lasagna, I can easily say the best lasagna pan for us is the Baker's Secret 1114459 Essentials. Why? It's the cheapest, lowest in maintenance, and has a lifetime warranty. Although we know the coating will chip off eventually, we don't make lasagna everyday anyway! And the lifetime warranty takes care of all other concerns! For $10, it's well worth it. You'll be able to gauge which pan suits you most by how frequent you make lasagna and what else you'll do with the pan. If you're unlike us, then we recommend that you get the durable one that's non-reactive and heats evenly. Did you find the article useful? If yes, please start sharing it! Do you know of other products that I failed to mention? Let us know in the comments and we'll share tips!